If you're a tenderfoot, beware! Our hottest sauce has a truly original zesty flavor that will make spicy food fans sit up and take notice. Made entirely by hand using only fresh vegetables, natural ingredients and the finest habanero peppers from the foothills of the Mayan mountains in Belize. 5 oz. 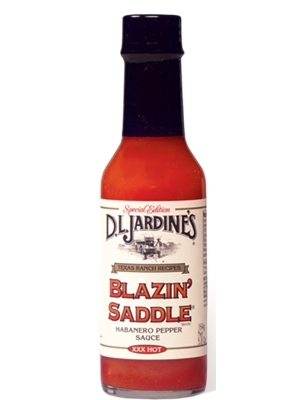 **Jardine's appears to have changed the recipe on their Blazin' Saddle hot sauce. Even though the ingredients are similar, our staff did a side by side taste test of the new and old sauce and did find that it tasted different. The old sauce had a more citrus flavor while the new sauce was less citrus and a bit more smoky or pepper flavor. The heat level seemed the same. Also, the newer version is produced in Columbia instead of Belize. Habanero peppers, carrots, onions, lime juice, vinegar, garlic and salt. I was doing some research on this product. We have been using it for over 15 years. Recently ordered 6 bottles via Amazon, and learned immediately that the formula is different. I am going to return the unopened 5 bottles, and begin a search for a replacement "go to" hot sauce. Sad they tried to pull a fast one. Not the same as the original that was made in Belize. Jardines needs to state that on their website because we had been getting this sauce for 12 years and now I had to return the most recent order. My husband was given a bottle of this years and ago and we've been looking for it ever since. It's his fave of all time hot sauce. You won't be disappointed.